I wish there was something more exciting to shoot! A person can only photograph so many cows and mesquite trees! :) It's "landscape" week in the POTD challenge, and what I wouldn't give for a beach or a hill! It's pretty flat around here, and this time of year the grass is starting to die, so it's not the most scenic place. Mike and I went for a drive last weekend waaaayyyy north in the county, about 2 miles from Oklahoma. It was a nice afternoon, and I found a couple of places to shoot. Oh well, even though it's flat and hot here, and the mosquitos are as big as sparrows, I wouldn't live anywhere else! God Bless Texas! Also, I'd like to clarify the Scenes from the Lake post from last week. Some folks made comments about my 'underwater' pic of Becca - sorry - but she's not underwater! She had just jumped off the dock, so the splash kind of looked like bubbles coming out of her mouth, and she landed on a blue floatie, so it just looks like it's underwater! Just wanted to clear that up! Thanks for looking! Oh I hear you on not having anything interesting to shoot where you live. I think I have exhusted all my options too...I LOVE this photo. It is perfect! Nothing to shoot here either. It looks like you found a very nice area for a landscape. 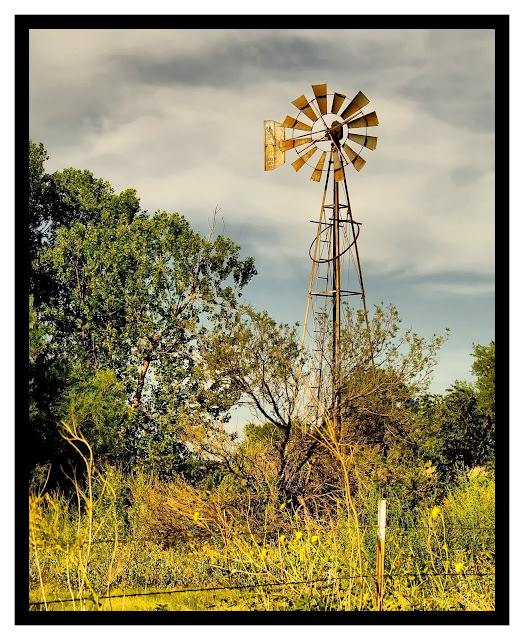 The windmill really draws my attention and the warm colors are perfect. Lori, what a GREAT shot! I love it--well done! I really like that photo! I love the colors and the clouds are great! The processing on this is so beautiful and amazing. The sky, the sharp yellow colors...so beautiful. This is wonderful... a pure slice of Americana! I really like this shot. I like the color, very warm and the way the sunlight is hitting the windmill. Great job!! What a great shot of where you are! The composition really makes this stand out. and here i was wishing to be in an area like that! doesn't that grass just always look greener? ;) what a beautiful picture and composition. and i really like your new blog header. ooh... I really like this! I really like the processing and that moody looking sky! I think we all get sick of our own surroundings sometimes. Hard to imagine we'd feel that way in say, Hawaii, though huh? I think this photo is pretty--I love the yellow tones and the processing you did. I get tired of shooting the same thing all the time too! But I love this shot.